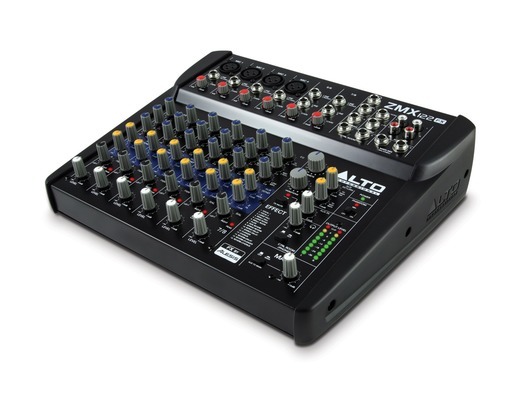 Alto ZEPHYR ZMX122FX is an 8-channel compact professional mixer suitable for a variety of live applications. ZMX122-FX is testament to Alto Professionals commitment to producing quality, high-specification products at an affordable price point. 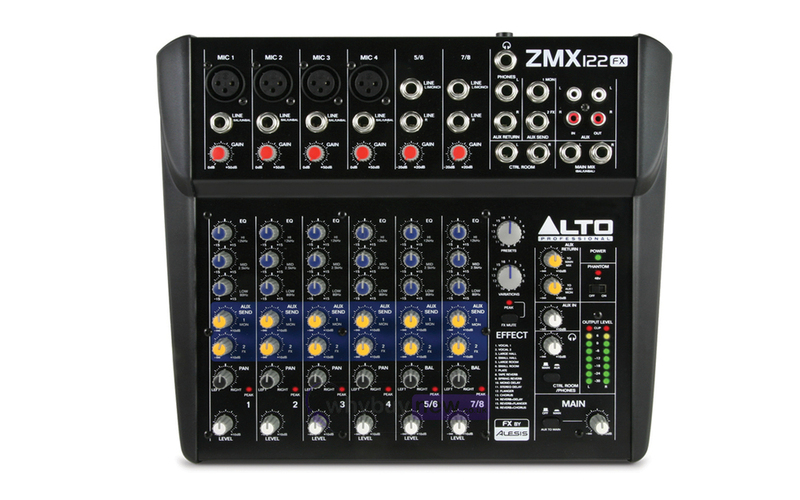 ZMX122FX features four microphone inputs with balanced TRS jacks (two with Phantom Power), a three-band EQ and two AUX sends on each of the four mono channels and the two stereo channels, and even two-track inputs for things such as audio playback. The ZEPHYR ZMX122FX is the perfect compact mixer for gigging bands, musicians and a host of other live production situations. ZMX122-FX hosts a wide array of 256 onboard 24-Bit DSP effects designed in partnership with Alesis. Adjust the dynamic of the sound with room and space delays and adapt your sound to the acoustics of the very you are in. Other, traditional effects such as reverbs, flangers, chorusus and more are included. The ZEPHYR ZMX122FX offers 16 variations of 16 professional Alesis effects from which to build, tweak, and dial in your sound. ZEPHYR ZMX122FX is a truly versatile compact mixer. Not only can you can plug dynamic, condenser, and wireless microphones into the first four channels, but you also get two stereo channel inputs for keyboards, drum machines, and other instruments. There is also plenty of scope to attach additional line-level devices such as MP3 player, CD players, or audio from a DVD player into the CD/TAPE inputs. But you also have two AUX sends that you can use to send streams of audio from your mixer to a digital effects unit, stage monitor, TV screen, or any number of sources. Choose the ZEPHYR ZMX122FX as the audio central command for your live performances, home studio, or video suite. 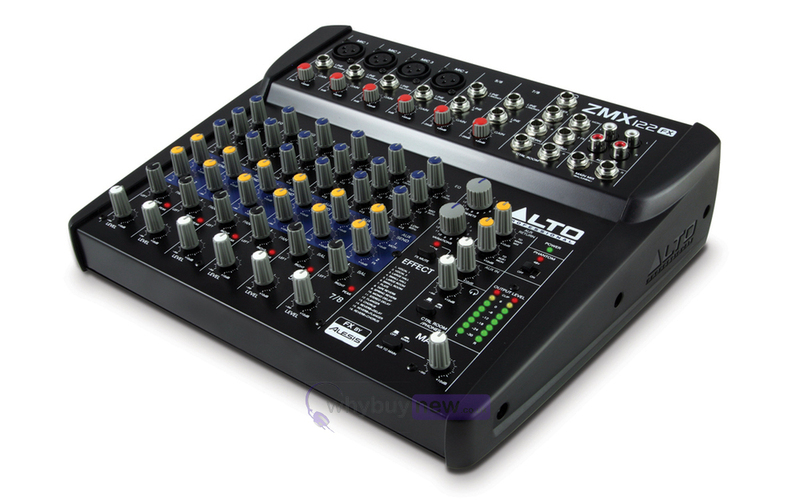 Here we have the Alto ZMX122FX Mixer in brand new condition and in B-Stock. The B-Stock versions would have been on display at a training evening or trade exhibition only and will come boxed 'as new' with all accessories and a 1-year warranty. Ideal for all functions! The extra head room really does benefit you when doing bigger venues. Not too big either, so easy to transport. Great desk! Arrived just in time. Perfect mixer !!! 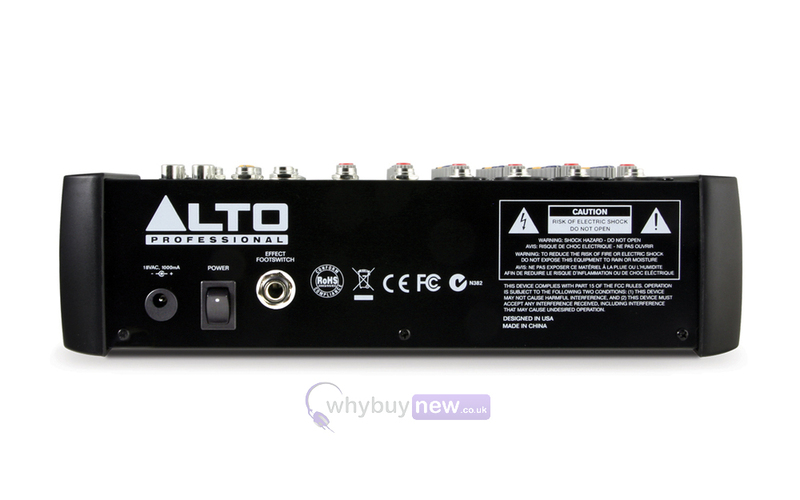 great little mixer from alto simple to use what more could u ask for.